There are a few things I haven’t done in Paris, I am still waiting for a rainy day that takes me to a movie theater for an afternoon and I have never slept in while in Paris. (shocking I know) I am an early riser and I also shoot all of my photos in natural light. Mornings in Paris are my favorite when the city is quiet and empty and the light is golden. I arrived in Paris in March on a Friday morning which meant I had a whole weekend ahead of me to fight jet lag. One of my goals this year was to really slow down so I don’t get burnt out. So I decided to take the weekend to enjoy with friends and put down the camera. I had a meeting as soon as I landed with Paris Perfect. Leah had a croissant waiting for me and we were able to walk to Bleu Olive a nearby coffee shop for a cappuccino. After shooting video and photos of a Paris Perfect Rentals apartment, I headed back to my apartment for the week to get settled in. I unpacked and took a walk to nearby Rue Cler to pick up wine, bread and cheese and a few groceries. I was very happy to find a 30 month comté at the Fromagerie. When it comes to comté, I prefer the older ones because they have more flavor. They will typically ask you if you prefer young or old. The younger one will be a lot cheaper, but spend the extra money to get the older one. Between traveling and adjusting to life back in Paris, I completely missed lunch on the first day and I was starving by the time I got back to the apartment. I enjoyed wine and cheese while watching the Eiffel Tower sparkle from my window. It wasn’t a bad way to kick off my trip. I had been craving a good steak frîtes and was planning on going to Le Relais d’Entrecoôte until I saw the line wrap all the way around the restaurant at 10pm. I ended up with steak frîtes across the street at another favorite Chez André. My apartment was a 20 minute walk away from the restaurant, so I walked back over the Seine onto the Left Bank. I woke up early Saturday morning to the sound of rain. With the excuse of the weekend, rain, and jet lag. I finally took the opportunity to sleep in until 11 am. The rain finally stopped before noon. I walked back to Rue Cler for lunch before a long walk on the Seine. I took the afternoon to flâneur (wander without purpose) around the Left Bank. I ended up in Saint Germain de Près around Bon Marché and then to Café de Flore. I spent the evening catching up with a friend over drinks at Le Fumoir. We had plans to enjoy an evening at The Louvre but the line was way too long. We skipped out and ended up at a wine bar nearby. Dinner was at Big Love (Ober Mamma Group) just below one of my old Marais apartments. The truffle pasta was a hit but I felt the pizza order was a miss. It could have been the one we chose but if you are looking for pizza in The Marais, try Ivoine’s instead. Sundays in Paris are my favorite. I stopped by The Bastille market for a quick stroll and then to the boulangerie at 28 Beaumarchais for a croissant. I took the croissant to Place des Vosges just a quick walk away to sit and people watch. The trees were still bare and it was pretty empty due to the cold weather but it is still one of my favorite places in Paris. One downfall of being an early riser in Paris is that the good coffee shops don’t open until 10 am. I had to patiently wait until Boot opened for a coffee on Sunday. It was well worth the wait as always and I took the coffee to go. Boot is pretty small and there are only a few seats inside, taking it to go is usually the better option. This is my full list of favorite coffee spots for your next visit to Paris. After coffee and a stroll, I headed back to the apartment on The Left Bank. I freshened up and headed off to an event at The Bristol. It started to rain again and continued through the rest of the night. After my event, I stopped by Rue Cler for an easy dinner before ending my weekend in Paris. *This post does include affiliate links which helps contribute to my coffee and croissant research. merci! My last entry into the Paris Diaries was way back in December. I had no intention of spreading out this series as much as I did but life got in the way. Part of me could have easily just not finished it just because of the time lapse but I love recording my daily life in Paris and I know as readers you have shared that you look forward to these posts. I started writing The Paris Diaries when the blog started back in 2016. I used to write these posts every night as I crawled into bed around midnight. Uploading, editing, and writing would take me until 2 am. I was out with my Paris Family and they reminded me to live in the moment and it was better to enjoy Paris and write about everything when I returned home. My morning started at Pavillon des Lettres. I had a project pop up from one of my US retailers so ate breakfast in my room and spent time uploading images for approval. I am always balancing a bunch of different projects and just because I am in Paris doesn’t mean that this can stop or be put on the back burner. The weather was still unseasonably warm so breakfast on the balcony was a real treat in mid October. I took a stroll around the neighborhood with my friend Katie and we stopped for coffee at Honor. They have a cute hidden courtyard to enjoy a chat. I made my way to Pavillon de la Reine which is the sister hotel to Pavillon des Lettres in The Marais. I checked in for one night at Pavillon de la Reine. This is one of my favorite locations in Paris. I love Place des Vosges and it has always been a very special place for me in Paris. This was a last minute change to my itinerary but I welcomed having a night here. Of course I am wore my favorite Blondo boots and Hudson jeans. Part of my Fall wardrobe but also, Blondos are the most comfortable walking shoes in Paris and they are waterproof. Before arriving to Paris, I scheduled dinner with my Paris family. I always look forward to these meals and it is so much fun catching up. I wish they were back in Chicago so I could see them more but I know they are happy in Paris. I picked up a bottle of wine at a little shop outside Place des Vosges on the way to their new apartment. If you look closely, you will see Martiene through the window. I took a tour of their new apartment and we caught up on travel stories before heading out in their new neighborhood for dinner. I have known Martiene since she was six weeks old and now she is ten! She grabbed my phone from my hand and ran up the stairs to the top floor and took this photo. She casually handed my phone back and told me my job was done. After dinner, we said our goodbyes after a few hugs and went our separate ways. It was late and Martiene had school in the morning. I rode the metro back to the hotel and caught up on work before falling asleep. As you can imagine after 8 days of running around and pulling really long days nonstop, I was exhausted. I still had a few more things on my agenda before the trip came to a close. For more on my favorite spots in The Marais you can check out this map. P.S. Don’t miss 10 ways to save money on your next trip to Paris. This post does include some affiliate links which helps contribute to my coffee and croissant research. Merci! I started off from my hotel in the early morning to chase the light and look for a decent cup of coffee. I was staying not too far from Montmartre so I set out on a walk only to hit a dead end in the coffee department. I kept walking where I discovered a new croissant on my way to Montmartre and hit an old favorite Cuillier. Montmartre will always be a special place for me as it was where I started my journey back in 2013. I had an apartment on Blvd de Rochechouart for three months. I explored a bit around Rue des Abbesses and I wanted to see what new places had opened. There was an Italian spot on this very corner that opened up. I returned here for lunch at Roberta for pasta on the terrace. I probably ate more Italian than French food this past trip but I wasn’t complaining. The weather was so nice, I couldn’t refuse sitting outside for lunch and people watching. It was nice to discover some hidden streets I hadn’t seen before in my old neighborhood like this one. I loved seeing this building covered in ivy. I am sure it is stunning in the later months of Autumn. The neighborhood has changed so much since my time in 2013. There are some parts that still hold that old school Parisian charm but much of the neighborhood is slowly letting chain stores take over. 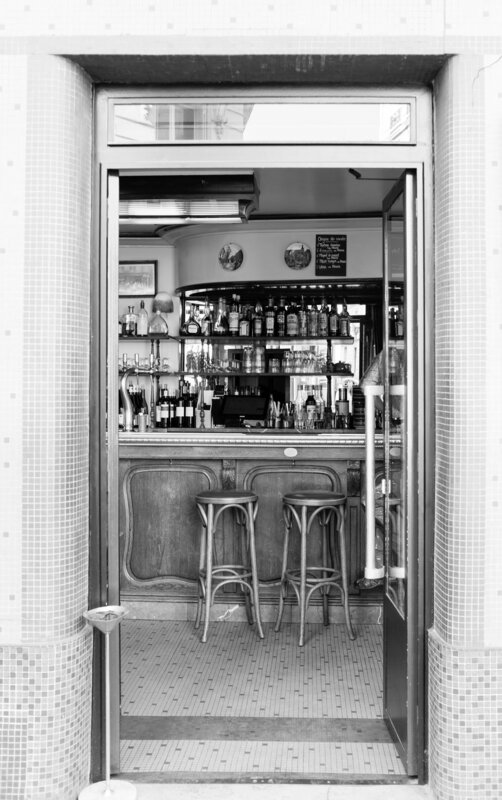 I stopped in La Mascotte for a cup of coffee and a seat at the bar. It is a great spot for people watching. It was this older gentleman reading the newspaper at the bar that drew me in. The coffee isn’t amazing but the people watching makes up for it. I walked back to my hotel in the 9th to check out and check into Pavillon des Lettres. I had only stayed at Pavillon de la Reine before this and I was very excited to explore this new hotel. The hotel has 26 rooms and each room is a different letter inspired by a French author. I was in room D for Diderot. This was my view from the balcony and you can imagine my face when I saw the Eiffel Tower. I wanted to stare at this view forever. This is where I decided to write the postcards from Paris. I have been sending readers postcards from Paris since 2016. It is so fun to surprise readers with a note from Paris. This is a tradition I carried on from my Grandma. I watched the sunset from my balcony for as long as possible before quickly changing clothes and meeting friend in Le Marais for dinner. We had drinks and chocolat chaud at Café de Flore until the café closed for the evening. When I jumped out of bed originally to run to the Seine, I knew I was short on time. I skipped brushing my teeth and washing my face. My routine takes a bit of time… It was more important for me to capture the light for the short time I was here. I also skipped my bra and put on my leather jacket over my toothpaste stained pajama t-shirt, I promise jeans and flats completed the outfit. Sorry, there are no photos of this look. But it did get a lot of attention. I continued to walk and walk along the Seine. It is one of my favorite things to do in Paris. The city was so quiet and the light was beautiful. I completely forgot what I was wearing or (not wearing) and continued to shoot and walk. Once the light was strong and bright, it was time to find coffee and a croissant. I found a nearby café on the Left Bank and took a coffee at the bar. There is a long story that happens at the bar but I ended up apologizing to the bartender in French. A few minutes later, I walked out with his phone number and an offer for a drink after his shift ended. A smile crossed my face, maybe I should go for the no bra/no teeth brushing thing more often? After my Mom read this story in the email, she sent a mass text to the whole family asking why I wasn’t wearing a bra! Thanks, Mom..! I made it back to the apartment to shower and change before my friend Katie came to the apartment to catch up and do a little work. We had breakfast on the balcony, a few things I picked up in the area including fresh orange juice. If you have not had the fresh orange juice in Paris, you are missing out. Katie is opening up a new studio in Paris and I was honored to see a preview before it was complete. It was just a quick walk across the Seine from Place Dauphine to the Left Bank. After settling a few hiccups with a shipment for the new studio, Katie and I headed to Odeon for lunch on a terrace because the weather was warm. Katie planned to do a photo shoot with me early the next morning. In true fashion, I wasn’t happy with what I brought along for photos so it was a mad dash around town before the stores closed to find something to wear. I planned to wear this Sézane top along with my new Coach over the knee boots but I needed one more piece. Before I left to run out, my sweet neighbors invited me over for a glass of wine. I picked up a few things while I was out to enjoy with them on their balcony. They were also renting from Paris Perfect rentals and their door was just next to mine. They were from Canada and frequent Paris visitors so it was fun to learn some cultural differences in Canada and share local Paris favorites. After a very fun and late night chatting on the balcony, it was time to finish work. I actually had a few hours left to wrap up some emails and projects. P.S. The photographs are available in the Print Shop for Purchase and To catch up on previous Paris Diaries you can see them here. For the first couple of days in Paris, I stayed at a friend’s apartment. I was still dealing with jet lag but when I woke up, she suggested we go to the Bastille Market. I jumped up at the chance and immediately got dressed. We didn’t have much time before meeting a friend but we still had time to visit the market. This is a Sunday tradition for me but I wasn’t sure if I would make it. I stopped by my favorite flower stand and bought pink dahlias. It was so cute to surprise the guys at the flower stand. They weren’t expecting to see me and I got a run and a hug and a kiss. I swear there was a smile thrown in there too which is rare for Parisians. We picked up a few more things and we headed off to the boulangerie to pick up pastries. We had some to catch up in the apartment before I got dressed and ready for lunch at Grand Hotel du Palais Royal. Their restaurant Le Lulli has a small terrace on a quiet courtyard in the center of Paris. They are on my Where to Eat/Drink in Paris list It was really nice to catch up with one of my friends over an amazing meal. My friend Léna always has the best outfits, it was 80 degrees in Paris so I put on this wrap dress and flats. After lunch, I headed across the Seine to check into my apartment with Paris Perfect Rentals. I have always dreamt of staying in Place Dauphine. This tiny square in Paris is located just behind Notre Dame on îl de la cité. I first discovered it by walking by and the whole area was covered in Chestnut blossoms in the Spring. I made my self at home at 25 Place Dauphine and even met the neighbors who invited me for a glass of wine before heading out to meet some friends for drinks and dinner. I always try to leave early if I have any sort of meeting in Paris because you never know what might catch my eye. I never want to miss a good photo opportunity. I am a light based photographer so my days literally start when the sun rises all the way until the evening light ends. This isn’t so easy when making any sort of plans in Paris but I actually love chasing the light. As my friends made last minute plans for drinks and dinner I only accepted with the plan that I would tag along behind them with my camera since they wanted to go earlier than sunset. You wouldn’t know it was October with the weather we had. The Marais is always busy on a Sunday but this particular weekend, the terraces were especially packed. We were lucky to get a table at Les Philosphes on Vielle du Temple. To catch up on The Paris Diaries you can read past posts here. By the start of Day 3 in Paris, I was feeling pretty well rested. My shoulders were killing me from carrying around my camera and lenses in my bag all the day before. I recently purchased a smaller camera and I decided to leave the big camera at home and take this one out instead. There is only one fixed lens on this camera and I haven’t gotten used to it yet but my shoulders needed a rest. While the camera is small, it packs a good punch and the file sizes are larger than my DSLR. I have had a few questions about my Cuyana bag that I carry, camera and lenses. I will do a post about this soon! I stopped for a coffee at Chez Janou and sat at the bar for a bit to people watch. This place is packed for lunch and dinner. Make reservations in advance if you can. They were turning people away that didn’t have a table booked. It was so warm this Saturday and felt more like Summer than the start to Fall. The city was packed with people and I wanted to explore somewhere new. I had on My Paris Agenda to see Paris in a new way. The Village of St Paul was just a short walk from The Marais but has a totally different feel. It has been on my list to explore for a while and they have antiques here on the weekends. I decided to stop for lunch at the most adorable spot. Le temps des cerises was packed inside and out but I managed to get a table for one inside. I am pretty sure I was the only American as all I heard was French. There was a chalkboard with daily specials along with a regular menu. The daily specials were limited and the one item I had my eye on was finished before I could order. I ended up ordering the duck with fig and mashed potatoes. It was incredible. After lunch, I was completely full and happy and continued on my walk. I explored more of St Paul and The Marais before meeting friends. I ended up meeting friends in the Marais at a bar called Martin on Blvd du Temple. The bar has a mixture of small seasonal plates and wine. We met here last year and it was the most vegetables I have eaten in one seating and I wasn’t complaining about it. The bill was split between 4 of us. The day was a perfect mixture of exploring a new part of Paris solo and catching up with friends. For the day, I went with a casual look. I wasn’t prepared for how warm it actually was going to be that day. I stripped down to a t-shirt and jeans and didn’t make enough time to go back and change before drinks. Paris was dressed up for Fall but it certainly didn’t feel like it. Temperatures were in the 80’s for the first few days of my trip. I wore a JCrew dress and my Blondo flats for my first meeting of the day. I brought my leather jacket but quickly learned it was way to warm for a jacket. I always like to leave early because I never know what will catch my eye along the way. I took a quick stop for a croissant at Utopie and a coffee in the neighborhood before arriving at Buly on Rue de Saintonge. I was happy to discover a new (to me) market just steps from the Boulangerie. I took a quick look and was on my way making a note to visit again another time. I arrived at Buly and enjoyed a café crème at the bar before taking a tour through the stores products. I wanted to steal this girl’s look from head to toe. I explored my old neighborhood and favorite street Rue de Bretagne which was right around the corner. I was sad to see it has lost some of its charm. There was a Ladurée that now replaced an old antique shop that sold way too many sunglasses and my old greek store was now closed. One of my favorite spots Le Progrès on the corner had been remodeled. It looked like it got a modern facelift and the old Parisian charm was now gone replaced by shiny new light fixtures and a fancy floor. I continued my walk to Canal St Martin where I had my Amélie moment on the bridge and checked out the new location of Miznon. The place was packed but I snagged one seat at the bar. I continued to walk and walk all the way to the left bank to Luxembourg Gardens. I hit over 12 miles that day but the weather was beautiful and I wanted to soak up every bit of Paris. I walked back to the apartment that night and eventually stopped for pizza for dinner. I don’t know why but I was craving a real Italian style pizza with fresh mozzarella and basil. I stopped to try a new place that had outdoor seating and was on the way. Not all pizza is created equal so I won’t be sharing the name of this spot. I would love to know your thoughts on sharing my opinions on here. I always want to be honest with you, but I never want to hurt a small business because I didn’t care for their service or food. I only write about a place and share details if it is worth recommending. Along with that, I ended up having a very late date on this Friday evening. I was still so tired and the date pushed back the date (he was late) until almost midnight. It was an amusing date to say the least. While a lot of my friends have asked me to share my dating life on the blog, I still want to keep it private until both parties agree to be shared. While it would make for a fun read, I wouldn’t want to be written about without my knowledge if the tables were turned. After walking so many miles with my camera and lenses, I decided to give my back a break for Saturday. I carry everything in my Cuyana bag which I love and has been around the world with me. Top zipped bags are essential in Paris for keeping everything safe. You can read my Paris safety post for more tips. P.S. Don’t miss the first of The Paris Diaries here. Welcome to the Fall Series of The Paris Diaries. This idea started two years ago when I took my first trip to Paris after starting the blog. It was a way to bring you into my daily life in Paris. It was a huge success with readers so I have continued it. I used to stay up late every night in Paris and write a recap of the day. Last year, a friend suggested that I live in the moment and enjoy Paris, I could write when I got home. It honestly took a huge weight off my shoulders and allowed me to be more present and enjoy my time in Paris. I barely slept on the plane which is pretty normal. I ended up watching a few movies include “The Book Club” which I thought was hilarious. I am loving Jane Fonda lately from Grace and Frankie. One of the blog readers I have gotten to know in Chicago ended up being on the plane. They had a girls trip and stayed at Adele and Jules. (It is on my Top Boutique Hotels List for Paris) You may remember this photograph from my trip in January. We rode into the city together and I made my way to my first accommodation of many. I will say that the weather is always grey no matter what season I arrive in Paris, but this was the first time it was warm and sunny. I had to take full advantage of it and fight the jet lag and desire to climb into bed. My first stop was the local boulangerie that was just around the corner from where I was staying. Boulangerie Utopie has one of the best croissants in Paris. I stopped by one of my favorite coffee spots for a café crème, Boot café. As I walked out the door with a coffee cup in hand ( I took it to go). I immediately wanted to start shooting the city. I remember having to put my cup down along the way because I needed two hands to shoot. I craved a good cup of coffee but my heart wanted to capture Paris. I had to run a few errands before the stores closed. This included a trip to the Pharmacie to pick up face wash, shampoo, and body wash. It has always been easier to pick up these things once I arrive so it doesn’t weigh down my suitcase and since I use mostly French products it saves me money. I will bring home the rest when I am finished. Since I was in the neighborhood, I held out for La Favorite. I crave their smoked salmon! The portion is huge and I couldn’t finish it all. There was great people watching as I sat on the terrace and the weather was perfect. I stopped for lunch in the Marais before picking up a SIM card for my phone. It is easy to pick up a SIM from Orange so I chose a lunch spot close by. After lunch, I realized Orange was no longer in the same spot. A quick check on the map and Orange was across the Seine and a long walk for my jet lagged body. I ended up finding a Bouygues store on Rue de Rivoloi. It was a quick transaction. There was a choice between a SIM card you could add to over time or one for my visit. I ended up getting 20 GB for 40 euros. I didn’t even use half of it during my two weeks and I was using it regularly to do Instagram Live videos. In the US, it is $10 a day with Verizon so this was the better deal in my opinion. I made my way around the city for a bit in a jet lagged fog. It is always strange coming back even if I am only gone for a few months. The city changed so much in just a short amount of time. I walked around as much as I could before deciding to go back to the apartment. The sun was beginning to set and rain was starting to fall. This was the only rain the entire trip. If I knew this, I probably would have walked a bit longer through the drizzle. I set my alarm for a quick nap because I couldn’t say awake any longer. I pulled myself together for the grocery for snacks and couldn’t fall asleep until 2 am. I am a terrible sleeper, but I live for that first good sleep when I make it abroad. I usually sleep so well that first night and the nap ruined it! I woke up early and had breakfast in my room at Pavillon de la Reine. I had a full day so waking up early was essential to fit it all in. I am not sure who roasts the beans or where they source their coffee, but Pavillon de la Reine has some of my favorite in Paris. That large silver pot was completely finished and if you know me and coffee, I was a very happy person. The weather was pretty nice for April, so I opened the windows and let the fresh air in while I caught up on work. I stored my bags at the hotel and I was off for a long walk before my lunch meeting in the afternoon. I wanted to take some time for me. I stopped by the cherry blossoms at Notre Dame with less of a crowd and let all the pink surround me like one big cloud. I walked to Jardin du Luxembourg and I am so happy I was wearing my blondos. I swear they saved my feet. The weather was nearly almost 80 and I had no jacket. I was only wearing a skirt and shirt. It was very summery for middle of April, but I was so happy to enjoy the sunshine for a bit. Since some of you have been asking, I do wear socks with these. Little footies you can purchase here. The weather was perfect! I watched the boats on the water for bit and really missed my niece and nephew. I hope I can bring them back here soon. My lunch meeting was at Le Lulli which is located in Grand Hotel du Palais Royal. I walked across the Seine but stopped at a quick park filled with blossoms on Rue de Seine. I ran into a reader who recognized me. It was so fun and I pretty sure I cried happy tears. You all are the best! I love Le Lulli for their lunch and I think it is the best kept secret for lunch and the location is so close to the Louvre but not touristy at all. It is tucked away perfectly. I would book ahead just because they were almost full during my lunch. You can get 2 courses for 29 euros or 3 courses for 38 euros. The set menu changes daily with the seasonal selections but the options are so good. I love the fish options, the flavor combinations are so good. After lunch, I headed back to Pavillon de La Reine to grab my luggage and I was off to a Paris apartment in a new to me neighborhood. I swear every time I moved, my suitcase got heavier. More skincare and more chocolate. This Haven in Paris apartment is a dream come true. I will share more details in a future post. I loved the light that hit the apartment in the afternoon. I met a friend in the neighborhood for a little rosé and a stroll. I was craving pizza for dinner and she gave into my cravings. After a very full day, I walked back to the apartment and caught the sunset on the way home. I was ready to get to bed early for the first time all trip. Running a business in the States and having meetings and contacts in France means my days were very long. I would typically go to bed around 2 am! So turning in around 10:30 was much needed. This post does include affiliate links which helps fund my coffee and croissant research. Merci! The weather was finally starting to turn in Paris. I couldn't exactly sit outside on the terrace at my hotel for too long but I could enjoy breakfast by the window. I taste tested one of each mini pastry and a cup of tea for breakfast. I had plans to meet a friend later for coffee. A little peek into my room at Pavillon de la Reine which I will share later. I met a friend close by at Boot café for a coffee and walked my old neighborhood in The Marais a bit. Merci is close by and that is always fun to stop into. I spent some time at Jardin des Plantes because I had heard the white tree was in full bloom and I didn't want to miss it. The gardens were full of people and I even ran into someone I knew. The weather continued to warm up throughout the day. I had lunch with a friend in the 1st arrondisement and I didn't want to risk being late so instead of walking, I took the train. It was line 1 which put me right in Palais Royal a bit early. I walked through one of my favorite places and you can see that people were out enjoying the weather in full force. I met my friend Nina of Insidr Paris at Sarah Lavoine which was just a quick walk from Palais Royal. We had a starter and main which was a fish tartare and coffee. The total for each person was 27.50 euros. Sarah Lavoine is a Home concept store with a café built in. They use all of their own dishes for sale in the restaurant. I wanted to take home the pink dishes but I am pretty sure they would notice! I went for a walk to see the blossoms by Notre Dame and I found myself a spot on the bench. I have photographed this area so many times it was nice just to sit and enjoy it all and watch the kids play under the blossoms. I include this in my where to find the cherry blossoms in Paris post. I headed back to my hotel in Place des Vosges and refreshed a bit before heading back out again. I was due to pick up a special package for my birthday at Pierre Hermé. The weather was finally cooling off and the Pierre Hermé boutique is a quick walk from the hotel. I chose a few pastries to celebrate my birthday and I was given a surprise box of macarons. Jacquart champagne sent me home with a bottle of champagne so I had a little impromptu party on the hotel terrace. The first tarte was a mixture of rhubarb, passion friut and strawberry called the Celeste tarte. The second pastry was the 2000 Feuilles which was hazelnut, praline, and chocolate. The first bite left me speechless (which is hard to do) I know I was sharing but the plate quickly found its way in front of me for a few bites. I know you are thinking how did I possibly eat all of this in one day? I can't figure it out either but I did walk over 10 miles so it somehow balances out. Right? I have to say, The Paris Diaries are so fun to write because I can share all that happened while I was unplugged. I love to explore the little streets of Paris and discover new spots. I met my friend Katie Donnelly early in the morning on Sunday. She came to the hotel and then we walked to Coutume for coffee and breakfast. I knew that I was scheduled to experience Brunch at the hotel later so I ordered porridge. I hadn't spent much time over this way so as we walked by I knew I wanted spend more time exploring. I dropped Katie off at her office for a meeting and walked back to the hotel. I walked past La Grand Epicerie which is typically closed on Sundays but I guess now they are open. I knew I wouldn't be back this way so I decided to stop in. If you have been following me on Instagram you know I just recently confessed I have a thing for grocery stores. This is the biggest and best one in Paris. They have a water room and look at the eggs. If you have a chance you should stop by and see this place! The weather was starting to warm up at this point and the grass around Paris was quickly filling with people picnicking. I headed back to the hotel but realized I wasn't terribly hungry which is shocking since I am always hungry. I took a walk around the area a bit before going in for Brunch. The Brunch at Le Cinq Codet was far more than I imagined and I am so happy I waited. I had a few different courses at Brunch. I will make sure to share the full details on this in a future post. I was still miserable with my cough so I looked up an open Pharmacie on The Left Bank. This is close to impossible on a Sunday. I found one which turned out to be an all natural Pharmacie but I did pick up some medicine which helped a little. The shop was beautiful! There was one thing I was still missing and forgot to pack. My lips were so dry and I literally carry this Caudalie lip balm in every bag of mine and I couldn't find one! Since the Pharmacie was all natural they didn't have what I needed but I finally found one on my walk. I made sure to buy a pack of three so I didn't run out. I found this guy walking around Rue Cler. I didn't need to walk down this street but his market basket was so cute, I walked behind him to see where he was going. I walked back to the Hotel to relax for a bit and I passed by an old car show since it was one of the first warm days of the year. I met up with my friend Magali for dinner. We chose an area that was in between us both since we were on opposite sides of Paris. We met on my old street in Paris for Udon. I took the metro back to the Left Bank for my last night at the hotel. There was more chocolate waiting for me and I had work to catch up on. I made sure to watch the Eiffel Tower sparkle as much as possible before going to to bed. A few things I always carry with me when in Paris. My favorite bag is this one which has a top zipper essential for keeping things safe when navigating the city. Always a notepad since I still believe in writing everything down on paper. Lip balm, pens, and of course my camera. Don't miss my Safety Tips for Paris if you want more info! I arrived in Paris still under the weather but I did manage to sleep a bit on the plane via the help of some cough medicine. I swear this was the key to fighting jet lag. After falling asleep again on the way into the city I felt pretty rested for a long plane ride. I typically never sleep and my flight arrives later. We had a 2 hr delay on the ground so I didn't arrive to Paris until the afternoon. I spent two lovely days at Le Cinq Codet on the Left Bank. My room was ready upon arrival and I was so happy to check in. As a Birthday gift, I was upgraded to the nicest room in the hotel. I felt completely spoiled. My terrace had a hot top with lounge chairs and a view of the Eiffel Tower. It is safe to say there were happy tears coming down my face. I quickly unpacked and showered to get ready for my meeting with Corey Frye. Since we were meeting in The Marais, I wanted to make sure I wasn't late so I headed over that way for a late lunch. I ended up eating at Le Favorite which is also where we filmed the video. I got off the metro at St Paul and was greeted by the most amazing cherry blossom display. It was still chilly but on the way to a warm up. Since I was still sick, I was dressed in my leather coat, scarf, and sweater. I did manage to wear my new red blondo flats and a red lip. After watching the video, I am so happy I wore the red lip. It might be my new favorite accessory after my bangs. We did a Live video in the Marais which you can see here. The original video is here. I had a blast with Corey! I walked around The Marais a bit before taking the Metro back to my hotel. I had plans to meet a friend for drinks to celebrate my Birthday. We ended up at Biondi for small bites and drinks. Afterwards we headed to the bar at Candalaria. I can't say much for the bar here since it was SO loud. I left thinking gosh I am old. I prefer places where I can hear conversations. The food looked great if you love Mexican and the cocktails were good. Just after being jet lagged and still sick. Yelling with no voice was not what I wanted to do. I headed back to the hotel where I was greeted with champagne and chocolates from Angelina on my pillow. The two ways to my heart were right there waiting for me. I put on my bathrobe and enjoyed the Eiffel Tower sparkling from my balcony at Le Cinq Codet Paris. I have been dragging my feet on writing this last post as it is my last part of The Paris Diaries Series for this trip. The whole time I kept asking myself, "Why didn't I stay longer?" I found a $500 ticket but 6 full days is never enough. 7 would have better, right? I actually turned down a very lovely invitation to an event that was scheduled for Monday, which made how I felt even worse. I woke up early to this view of Parisian rooftops down Rue Jacob from my stay at Hôtel des 2 Continents. I remember standing here first thing in the morning as the sun was rising behind the grey clouds. Tears filled my eyes as I took a deep breath. I know it looks like my life is "picture perfect" which is part of my job as a photographer. Each trip is fully funded by me which always feels like a risk. Will I get good photos? Will be audience like my new work and will I be able bring home enough content for my readers? There is so much pressure that I personally put on myself as solo business owner. I do a lot of research and behind the scenes planning before leaving for Paris. As I stood on the balcony with tears now running down my cheeks, I said out loud how grateful I was for being there and all the hard work that brought me to this exact spot. There are a lot of late nights and early morning work sessions that I don't always talk about. It is hard to show you the view that I had from my little balcony but believe me it was pretty Paris perfect. I had a cup of coffee on the balcony and enjoyed the view until I absolutely had to leave. I wasn't going far. I had planned for a morning at café de flore. My typical Sunday morning involves the Bastille market but since I was staying on the left bank, I already decided I wasn't going to stress about going. I had an attempt on Thursday and most of my favorite vendors were gone. So you may think this photo is a little cheesy and yes it is true. I was sitting there enjoying my time. I have a favorite waiter and sadly he was out due to an accident. The waiter that served me asked if I wanted a photo and I couldn't say no. He did a good job with the café de flore behind me. This café is a little touristy, yes. But I have been coming here since the beginning of my Paris story and it just tradition. I sat here and wrote all of your postcards! This was probably the longest I have ever sat solo at a café. There were a million things I wanted to do on my last day in Paris and here I was not doing any of them. But I do recall saying that I wanted to sit at a café and do "nothing" so maybe I did actually accomplish something on my list. I decided to take my bags from the hotel which was just around the corner so I didn't have to return. It was a quiet morning so I had room to leave my bag on the seat next to me. It was fairly cold so I am all bundled up in my coat and scarf and boots. I talk about all these things and I am wearing it all here. This was one of the only photos that was taken this short trip so I am very happy to have this as a memory. If you want to know more about what I packed for Paris you can read here. I took a little time to start reading the next book club book "A Moveable Feast" and sip at café crème like Hemingway. I hadn't planned to get a croissant but for "research purposes" I was curious how the croissants would match up to a local boulangerie. I have to say I wasn't disappointed. It was the perfect combination of butter and pastry. Total cost for a morning at café de flore with a café crème and a croissant was under 10 euros. I ended up taking the bus back to île st louis from st germain. It was so convenient as there was a stop right outside my apartment and one just across from the café. It saved me a ton of time and I was able to walk around the island a bit. Time was moving so fast this last day. It was actually warm enough for ice cream and I was so tempted to stop for a scoop at berthillon but I had plans to meet my Paris family and I was running late. We had plans to go for a walk as soon as I arrived because it got dark pretty fast. The minute I arrived, I was greeted with a huge hug and an invitation to dinner. We took a long walk around parc monceau where we did spot a few pink blossoms. After the parc, we headed around the neighborhood while dinner cooked. I hadn't spent much time in the 8th arrondisement until my Paris family moved here but I am loving it more and more every time I visit. We ended the evening on rue de levi to pick up desserts. The day with my Paris family was short but sweet and I am so happy that I got the chance to see them. I headed back towards île st louis to pack up my belongings and get ready for my trip home. I had one last meeting with a friend at Café St Regis. They stay open pretty late which was nice to have the place a little more quiet on a Sunday night. I had some work to catch up on once I arrived back at the apartment and last minute details to take care of before spending ALL day flying home. There is no direct flight from Chicago to Paris in the winter so I had a connecting flight which made my trip a lot longer than normal. I am not complaining. I had a decent seat and I watched a few movies to pass the time. The hardest part is always coming home. I honestly feel like the trip was all one big dream. It is so different between Chicago and Paris. If it wasn't for all the pictures I take each trip I don't know if it would feel real. Going through all the photos and picking my favorites is such a joy. It is like unwrapping presents one by one. They each carry different memories with them. As for the most popular question I am getting, "When will I be back in Paris?" I wish I had an exact answer. My hope is to be back in April for my birthday. My apartment is rented so I am having a little trouble finding accommodations. Suggestions are welcome. This will be another short trip as I have some commitments in May. Stay tuned for more details. I would love to continue the Paris Diaries as a bigger series and take you more into the daily life that is more day to day life in Paris and more about my job(s). Thank you to each and every one of you for reading and making this blog such a joy in my life. I didn't talk much about the flooding but it did affect my trip. Ile st louis is surrounded by water and since it was a news highlight from around the world, the island wasn't so quiet. The weather was dark, rainy, foggy and cold. I can't say I expected much more in January but snow would have been nice. This was the view from outside my apartment. Typically, you can see the eiffel tower but you can barely see her with the fog. I had the day to myself which was very important to keep. I had marked it off on my agenda for no plans, which I later made a minor adjustment. I made a walk to the Marais and visited my old hood. If you haven't been, Le Progrès is one of my favorite spots for people watching and steak frites. I wanted to spend most of my time on the Left Bank this day. I booked a hotel for the evening on Rue Jacob at Hôtel des Deux Continents. I checked into the hotel and walked around the neighborhood before meeting up with Corey Frye for our Left Bank walk. I don't know why but time moved so quickly this day. I had a quick coffee at the hotel before heading out. My room was on the top floor and it was small, but the balcony and view made up for it. You can read all about my walk with Corey Frye here and see the photographs I took during the walk. We enjoyed a café chat afterwards on rue de buci. By the time the café chat was over, it was dark in Paris. I headed back to the hotel to freshen up and get ready for dinner. I have a favorite spot that isn't too far from here but I wanted to do something different. During the walk, Corey mentioned Hemingway used to eat dinner at Le Pré au Clercs on Rue Jacob. I had dinner there a few years back and I loved the cozy atmosphere and they had jazz playing inside. For other restaurants in the area, there is Le Relais Entrecôte for the best steak frîtes. Be prepared to line up as they take no reservations. It is worth it. I was tempted to stop out for dessert or another glass of wine after dinner but I was feeling tired. I walked St Germain de Prés and ended up with a crêpe. Not a bad way to end the night. The point of me taking the day for me wasn't to jam pack it with activities but to slow life down a bit and soak in Paris.